This page summarizes information provided at the Aluminum Electrical Wiring Hazards Website – at the online encyclopedia InspectAPedia.com®. What is the Aluminum Wiring Hazard? 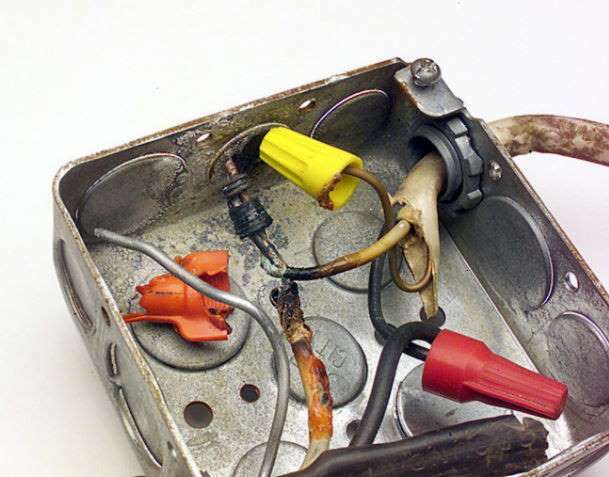 Aluminum electrical wiring, used in some homes from the mid 1960’s to the early 1970’s, is a potential fire hazard. According to the U.S. Consumer Product Safety Commission, fires and even deaths have been reported to have been caused by this hazard. Problems due to expansion can cause overheating at connections between the wire and devices (switches and outlets) or at splices. CPSC research shows that “homes wired with aluminum wire manufactured before 1972 are 55 times more likely to have one or more connections reach “Fire Hazard Conditions” than are homes wired with copper. “Post 1972″ aluminum wire is also a concern. Introduction of the aluminum wire “alloys” in 1972 time frame did not solve most of the connection failure problems. Aluminum wiring is still permitted and used for certain applications, including residential service entrance wiring and single-purpose higher amperage circuits such as 240V air conditioning or electric range circuits. How do I Reduce the Risk of Aluminum Electrical Wiring? As of the current date of this page, only two remedies (1 – Discontinued Use and 2.1.- COPALUM, below) have been recommended by the CPSC. The COPALUM connector, a special connector and special crimping tool licensed by the AMP Corporation. The AlumiConn TM aluminum to copper lug connectors [New in 2006, U.L. Listed, 2007 completed independent testing] available from King Innovation. Results of independent testing indicate that this product “… is predicted to have a high probability of failure-free long-term safe performance, PROVIDED THAT THE SETSCREWS ARE CAREFULLY TIGHTENED TO THE MANUFACTURER’S RECOMMENDATION“. We anticipate that the AlumiCon™ connector will be recommended soon by the US CPSC as an alternative to the COPALUM. Emergency temporary repairs necessary to keep an essential circuit in service might be possible following other procedures described by the CPSC.